figure 7.3 Cross section of Apium sp. petiole showing parenchyma (arrow), epidermal, and collenchyma cells (C). Bar = 100 pm. figure 7.4 Astrosclereid (arrow) in Castalia sp. leaf (Extant). Bar = 150 pm. figure 7.5 Cluster of brachysclereids (arrows) in Pyrus sp. fruit (Extant). Bar = 250pm. among these types. Sclereids and fibers function solely in support, whereas tracheary elements function both in support and water conduction. Sclereids are variously shaped, from isodiametric to elongate and branched. They are characterized by a very thick wall with simple pits, that is, there is no special ornamentation associated with the pits. Generally, sclereids are shorter than fibers. Fibers have very thick secondary walls like sclereids (FIG. 7.5 ) but are elongated, spindle-shaped cells with long, narrow cell lumens; the lignified wall generally contains simple pits with slit-like apertures. 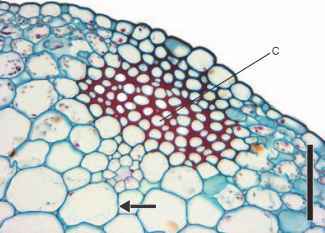 They form supportive structures in tissues after the elongation growth has ceased and occur in many plant parts; many fibers, such as flax and jute, are of economic importance. Fibers commonly grow by intrusive growth, that is, the cells elongate and grow between other cells until they reach their mature length. 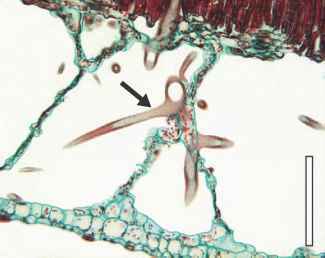 They are common in both the primary and secondary xylem and phloem, especially in woody angiosperms, and can make up a considerable proportion of some of these tissues. 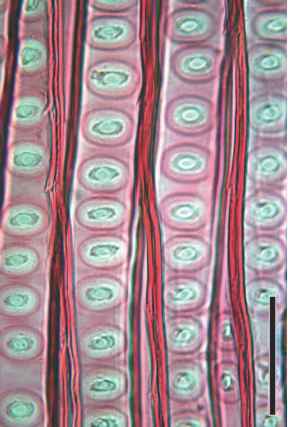 Conifers have no fibers in their xylem but may have some in the secondary phloem. In some angiosperms, fibers are commonly found as a "cap" (FIG. 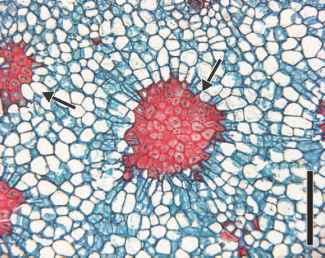 7.6) on the outer surface of the vascular bundle or as a band near the periphery of the stem. Fibers are classified according to their position in the plant into xylary (fibers in the xylem) and extraxylary (fibers elsewhere) fibers, for example, in the phloem or cortex. figure 7.6 Cross section of Helianthus sp. 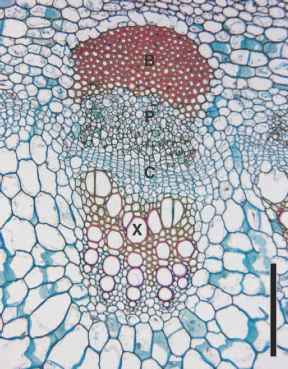 stem vascular bundle showing prominent bundle cap (B), phloem (P), cambium (C), and xylem (X) (Extant). Bar = 250 pm. tracheids have primary wall material present on their end walls; both have lignified secondary walls and both can occur in primary and secondary xylem. Both cell types also may have various types of secondary wall patterns on their side walls. Vessel elements are more efficient at water conduction, as there is no barrier to water movement from cell to cell vertically, whereas water must diffuse through primary wall at the end of each tra-cheid. Although tracheids are often narrower and more elongated than vessel elements, this is not always the case. figure 7.7 Tracheid of Pteridium sp. showing scalariform secondary wall thickenings (Extant). Bar = 40 pm. material—bordered pits (FIG. 7.8). The border is a dome-shaped structure, made of secondary wall, that surrounds and arches over the opening in the secondary wall, that is, the pit. There is an opening in the center of the "dome," the aperture (FIG. 7.9). It is important to remember that the pit itself is not a "hole" in a tracheid or vessel wall, it is merely an area where there is only primary wall and middle lamella (the area between two cells) present. This area is called the pit membrane. Neighboring tracheary elements often develop bordered pits, a pit pair, at the same location on adjacent cell walls. In conifers and a few angiosperms, pit pairs can be very elaborate. In the center of the pit membrane is a thickened area, the torus, which is slightly larger than the pit aperture. Around the torus some of the primary wall and middle lamella are partially dissolved, so this area, the margo, is thinner and very porous, consisting only of strands of cellulose microfibrils. The permeable margo allows for more efficient water conduction in these pit pairs. The margo is somewhat flexible and under water stress, it can move to one side of the pit pair and seal it off. When small bubbles of air form within the water column in the xylem, they can restrict water flow (embolism), or in some cases, the water column can suddenly collapse (cavitation). Severe cavitation can cause the collapse of the tracheary element. Both drought and the freeze-thaw cycle can precipitate cavitation in the xylem. figure 7.8 Pinus sp. 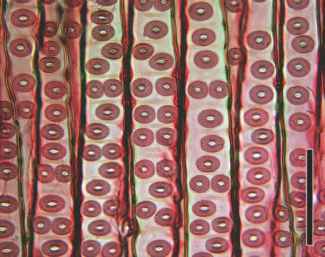 secondary xylem tracheids with circular bordered pits (Extant). Bar = 50 pm. 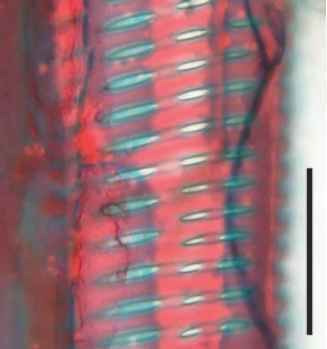 figure 7.9 Circular bordered pits on secondary xylem tracheids of Sequoiadendron giganteum. Note uniseriate and biseriate pattern (Extant). Bar = 100 pm. figure 7.10 Cross section of Cucurbita sp. 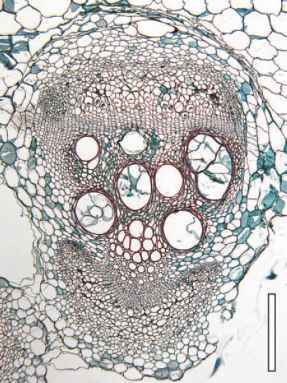 vascular bundle showing larger diameter vessel elements (center), many with tyloses in them (Extant). Bar = 650 pm. Tracheids and vessel elements with annular or helical thickenings are extensible, so they are most often found in the earliest matured primary xylem (protoxylem, see below), since they can stretch somewhat as the axis continues to elongate. Scalariform thickenings are variable; depending on the amount of wall material deposited, it may grade between helical and pitted. In a tracheary element with pits, most of the primary wall is covered by secondary wall, so these elements are not extensible and occur in primary xylem that has matured after the axis has ceased elongation growth; this part of the primary xylem is called metaxylem. Secondary xylem is made up predominantly of pitted tracheids, although some plant groups also have scalariform secondary xylem tracheids. Vessel elements represent a more specialized type of tracheary element (FIG. 7.10). They are usually shorter than tra-cheids and have perforated end walls called perforation plates. Individual vessel elements are connected end to end in vertical rows to form vessels; each vessel is a continuous tube with little or no obstruction to water flow, depending on the size and type of perforation plates in the end walls. These can vary from simple perforation plates, with a single large hole, to those with scalariform or reticulate openings. The gnetophytes (Chapter 19) have a unique type—foraminate perforation plates. The most specialized vessel elements are relatively short with horizontal end walls and simple perforation plates, whereas some woods contain vessel members that are more elongate, with oblique end walls (Bailey and Tupper, 1918). Tracheids and vessels occur in both primary and secondary xylem tissue. Like tracheids, vessels also exhibit various secondary wall thickenings on their side walls which range from annular to pitted. Although vessel elements have sometimes been thought to be a synapomorphy of the flowering plants, they apparently arose independently in a number of plant groups (Bailey, 1944). The anatomical evidence for independent origin has been well illustrated in the detailed studies of Schneider and Carlquist in homosporous (Schneider and Carlquist, 1998) and heterosporous (Schneider and Carlquist, 2000c) ferns, and in certain lycopsids (Schneider and Carlquist, 2000a,b). Vessel elements are also known in several gymnospermous groups, including the gnetophytes (Carlquist, 1996; see Chapter 19) and the enigmatic fossil group, the gigantop-terids (Li et al., 1996; see Chapter 19).